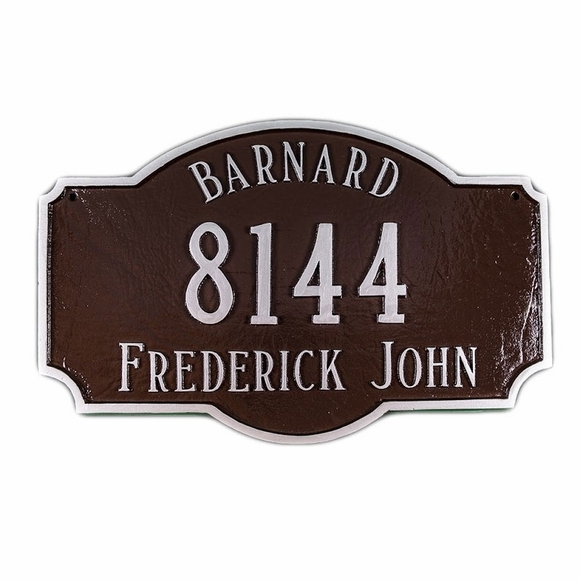 Custom Address Plaque - - three-line sign personalized with the color scheme you choose, one or two address lines, and your family name or other text under the arch as shown above. Wall mount or lawn mount. Modified arch shape. Available with jumbo 8" numbers. Made in USA. For jumbo 8" numbers, order a one-line estate size plaque. Standard plaque is 24"W x 15"H.
A one-line standard size plaque holds five (5) 4.5" numbers. A two-line standard size plaque holds five (5) 3" numbers on Line 1 and seventeen (17) characters on Line 2. Optional family name on top above number up to twelve (12) characters. Estate plaque is 26.67"W x 16"H.
A one-line estate size plaque holds five (5) jumbo 8" numbers. A two-line estate size plaque holds five (5) 4.5" numbers on Line 1 and up to seventeen (17) characters on Line 2. If you are using just one address line, please leave the Line 2 input box empty. If you don't want a family name, please leave that input box empty. Custom address plaque. Jumbo 8" numbers available on a one-line estate size plaque. Made in USA.